We arrived at Lamanok Island and the moment we start our tour I think by myself; ‘hmm, I’m happy I brought my flipflops.’ Since it is high tide, the tour includes some walking through water and mangroves and with the first steps on the island my feet are already wet. We were introduced to the island that is it a sacred place and please to be respectful to all the spirits the island has and don’t be surprised if you feel something ‘un-natural’ while strolling over the island. Open minded we followed our guide to the first highlight. The first eye-catcher you meet already before you reach the island itself and is visible from your small peddle boat. This old Oak wooden cross stands his pride looking over the sea on a beautiful location. According to our guide the wood of the cross came from Portugal and was brought by Ferdinand Magellan himself when he was entering The Philippines coming from the East to Cebu Island when he had a small stop on Bohol island. To be honest, I’m not really sure about the story of this cross, but the location is amazing, and the view is even better. 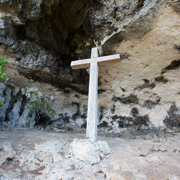 Even if this cross wasn’t originally placed in The Philippines before the famous ‘Magellan’s Cross’ in Cebu City, it is still worth the small hike up the mountain. Trust me! 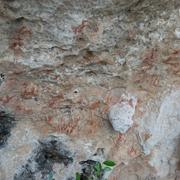 Not far from the historic cross you can see the Hematite paintings dating back the pre-Spanish era. Personally, I would call them Hematite ‘printings’ instead of paintings since it is very hard to recognize any kind of image in these ‘paintings’. All I could see were a couple of fingerprints and a hand palm wipe but I do have to agree that they looked very old to me. We continued our tour land inwards.